Believe it or not, one of the biggest struggles that I had in the lead-up to Costume SuperCenter’s exhibitor debut at New York Comic Con wasn’t in regards to special guest appearances or a blueprint for our booth’s layout. It was related to my wardrobe. According to my planning partner, @CSCBrittany, I wasn’t geeky enough for an event like this. I don’t have drawers filled with graphic tees, and I wanted to make a good first impression on the people we’d be meeting at the convention. I wanted to look like a professional, and I wanted people to want to work with me. For that reason, I went to NYCC on Press Day dressed in a button-down shirt, dress pants and a classy pair of Air Jordan sneakers that I only break out for the really special occasions. Then, after the first day of Comic Con, with a little push from the team here at Costume SuperCenter, I was somehow talked into dressing in costume for a day. No, that doesn’t mean I was going to put in the blood, sweat and tears that some cosplayers put forth into their creations. Actually, I wouldn’t be making anything at all. But I wanted to embrace what CSC has been preaching since the day I launched Cosplay SuperCenter a few short months ago – Cosplay isn’t entirely about creations and modifications. Cosplay is about having a vision of your favorite character, dressing as your favorite character, and, even if for just a few short hours, becoming your favorite character. 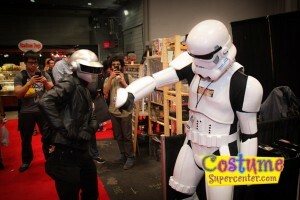 For that reason, I showed up to the Javits Center a little early the next day, stripped down the mannequin that leaned up against our booth’s grid walls and transferred its Stormtrooper armor onto my own body. After I was head-to-toe in white armor (which, after you dress a mannequin in it four or five times, is super easy to put on yourself), I had to decide how I was going to approach the next few hours. 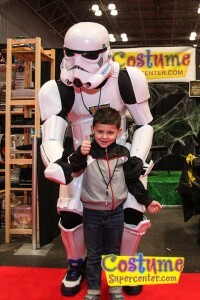 I could have acted like an authentic Stormtrooper and guarded the CSC booth. I could have pretended to be the mannequin and catch people off-guard as they went to take pictures. Fortunately for me, my entire body was hidden by the costume, so anything I did was done anonymously and no potential blackmail could be found in my actions. So, as anyone who wanted to make the most out of an uncomfortable situation would do: I danced. 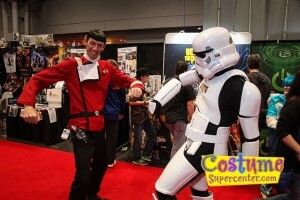 I was featured in videos on Vine as the “Dancing Stormtrooper.” I danced with a guy dressed like Spock from Star Trek. I danced with two guys dressed like Daft Punk. I danced with a guy who beatboxed for me. I danced and danced, and not a single soul, aside from the people working with CSC at NYCC, knew that it was me. Obviously, I was thrilled about the fact that I got to dance when I was supposed to be working. I was thrilled that I somehow convinced my bosses to even let me go to Comic Con in the first place. What I wasn’t thrilled about, however, was how (really, very, amazingly, so incredibly) hot it is inside that costume. If you’re just hanging out and taking a leisurely Stormtrooper stroll, sure, you’ll be fine. But if you’re out there busting intergalactic moves for three hours at a time, I’d advise wearing a sweatband and bringing a large bottle of water with you. That said, if that’s the one downside to my experience, I’m already over it. I had a great time dancing with attendees of the Con, and I’d love to do it again one day. 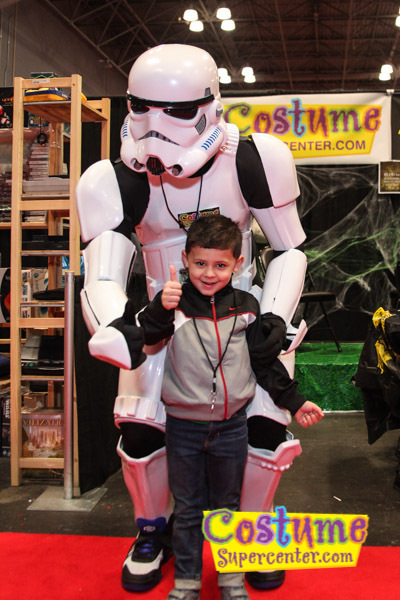 So, kids, take it from the “Dancing Stormtrooper.” If you’re ever doubting yourself as you prepare to cosplay, don’t. Put on your costume and own it. Dance like nobody is watching… Or at least like you’re wearing a helmet so that nobody knows it’s you!